People are asking a lot of questions about circular saws, so let’s bust all the myths about this versatile tool. If you are about to buy your first saw, a circular saw should be your pick as it is capable of so many different tasks. You may have heard about trim saws and farming saws and wonder what is the difference between these two types of portable circular saws. But before we get to that it is worth going over the advantages of a portable circular saw. If you a carpenter or a builder, or you just want to do some projects around your house in your spare time, I would highly recommend this versatile tool. If you are new to woodworking, your budget is limited and you have patience and will to learn, a circular saw is the best to start with. What to look for in a saw? This tool is capable of creating straight cuts, rip cuts, crosscuts, miters, and bevels. Don’t forget that this tool is very portable, so you can take it with you just about anywhere. Imagine that you have decided to buy a circular saw. You go the nearest specialized shop and there seems to be a bunch of different circular saws, from small and battery-operated models with 5 inches blade, up to beast with a worm drive gear that turns the blade offering more torque and control. These are the extremes, but you will be amazed by the number of saws under the circular saws category. You may want to skip the extremes and consider something between them – or the sidewinder circular saw. The direct drive saw, can be operated from both sides of the motor. 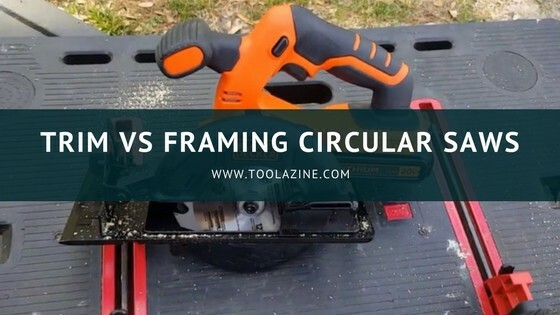 I won’t be explaining every single model or type of circular saw in this article, but will focus on the comparison between a trim saw versus framing saw. I guess you are impatiently waiting for me to start, so without any more hesitations, let’s go. This is basically the smallest available circular saw – 5 inches saw, usually with a nice blade which is located on the left side, looking from the motor. This is good in most cases as you can view the blade path (if you are a right hander). You can find these saws in 120V alternating current, and different voltages varying from the type of the battery. However, the key characteristic is that the trim saw is a small saw with a small blade. For a good budget price trim saw is suggest the BLACK+DECKER BDCCS20B. A framing saw is a much bigger saw with 7 ¼ inches or more. A framing saw can be used for cutting a huge variety of different materials and come with several different blades. This type of circular saw is often referred to Skilsaw, from Skil, which is one of the biggest manufacturers of this type of saws. Before I go down to the direct comparison, there are several things you need to understand. These are the basics of circular saws and are a must-know if you want to understand the difference between the types. For a good budget price framing saw is suggest the PORTER-CABLE PCE300. The circular saw has two handles – front and rear handle. Let’s with the handles. The rear handle has the safety switch and the trigger while the front handle offers stability when cutting through the wood, or whatever material you want to cut. Next, the baseplate is resting on the top of the lumber and is used for setting the depth and the angle. Note this – when setting the depth make sure that the blade goes just below the material. If the blade goes too deep, the risk of injury is increased and it is harder for the saw to cut. When setting the angle, just take a look at the markings and choose the desired angle. You may want to calibrate your saw with a set square or something like that when you first use it to make sure that the angles are correct. The blade guard will protect not only you from any possible injuries, but will also save the blade if you leave it sitting. Plus, you can manually retract the guard which can be useful when you make plunge cuts. You will notice a notch at the front of the baseplate, which is a great indicator of the blade position when regular cutting, and another notch that does the same thing, but when you are doing angle cuts. Put the front part of the saw on the lumber you are about to cut and make sure that the blade does not touches the wood. Pull the trigger and wait till the blade spins up to its full speed, which usually doesn’t need much. Now, push the blade smoothly through the material and guide yourself with the notch. Don’t go too slow, but do not push too much, as the blade will do the job. When you have finished cutting the wood (or whatever material you are cutting), release the trigger and wait for the blade to stop spinning. Remember this – the part you are cutting needs to fall freely, so don’t support the material on both sides, as cutting that way could result in a kickback. In the end, it would be nice to have different blades for different cuts, as blades are made from different materials based on what are cutting. No matter what type of saw you decided to buy, there are several features you need to consider. Circular saws have a base plate that allows to turn it from 90 to something less than 45 degrees which allows you to make cuts with beveled ends. Well, when you are cutting wood for projects, you would probably like to cut the wood in the desired angle in order to create nice looking corners. Most of the saws have a lever which is used to keep the blade at the right angle. You can set the blade depending on the required cut, but make sure that is less than the full depth of about 1/8 inches. How can you fix the blade? On the rear handle, you have another lever that is used to locking the plate, this time, at the desired depth. This is one of the most important features you need to look for. The blade guard comes in two parts – fixed and floating. The fixed part covers the top of the blade, while the floating part rolls as you push the saw in a given direction. Apart from this, you need to use head protection. Head protection includes a dust mask, protective glasses and ear protection. Using a circular saw is not a game – you need to pay attention to the smallest details as you may be easily injured. As you don’t want that to happen, you may want to use some protective gear. Amston dust mask – a box of 20 masks for one-time use. They are lightweight, easy to breathe through and saves you from the smallest dust microns. Check the latest price of the Amston dust mask here on Amazon. Gateway safety glasses – flexible glasses, great for different applications and suitable for both indoor and outdoor use. Check the current price of the Gateway safety glasses here on Amazon. 3M Peltor Ear Protection – good fit and balance, and they can be used for hours and protect your ears from the noise. You can check the latest price of the 3M Peltor Ear Protection here on Amazon. These are the elementary features you need to look for. But, there are several others that need to be considered as well, as they can make your work lot easier. You may want to keep an eye on saws with this feature, as it can be very useful. How? It guides the blade, giving a parallel and straight cut, which is very good if you are planning to make a rip cut. Why don’t use the development of the technology to make the cutting even easier? Rather than following a pencil-draw line, you can follow a laser line on the wood. Not every saw has this feature implemented. In case you have bought some of the older models, you can purchase only the laser without having to buy a new saw. We covered pretty much everything, from the features you need to consider, up to the parts of the saw and how to use it. But in order to make the right pick, try to answer these questions. Can you change the blade? The quality on the cut mostly depends on the blade, so you need to make sure that it is the right blade for the particular material, that it is sharp enough and the most important thing – that its change is an easy and safe task. To be honest, this is a personal view. Ergonomics is more than the weight and size of the tool, it is basically a feel – so, ask yourself, how do you feel with the tool in your hands? Can you see what are you doing? Most of you may find this ridiculous, but just as ergonomics is important, your saw needs to be designed in a way you can constantly see where the blade goes. Which battery will give you more run-time? Many circular saws run on battery, so you need to find the model that will provide you with the longest run-time and outstanding performances. Lastly, we have come to it. The differences between a trim saw and a framing saw with their advantages and disadvantages. For better understanding, the comparison is divided into several sections. So, let’s start with them, one by one. Since both are circular saws, what makes the difference? Trim saws are the smallest saws available, so every saw with a blade smaller than 6 ½ inches is considered as a trim saw. On the other hand, framing saws usually have a blade of 7 ¼ inches or more, which is basically a standard size for a circular saw. The blade is an important part of the saw for both trimming and framing applications. However, the size isn’t the only thing you need to consider. Trimming applications, or simply said, where the cut will be seen, require more teeth for slower and nice cuts. The smaller blade also means that you will not be able to cut through thick pieces of wood. The blade just does not go deep enough to get through. Trim saws are usually more compact and low power so are limited in what you can do with them. But framing applications mean a more powerful tool is needed for quick and rough cuts or larger pieces of wood. A framing saw is more powerful and can handle more applications. Larger (framing saws) can also be used for trim applications (with the right blade) which makes them more versatile. In the end, what really matters is what are these tools used for? Trim saws are the best pick if you only want to do smaller, finer cuts, you are an occasional user and you have a lower budget (trim saws are usually cheaper). In case you want to build a cabinet, bookshelf, chest of a draw or other woodwork – go for the trim saw. It is a better choice for small projects – this tool, some wood, and your creativity is enough to start with. In addition, a good table saw or good and even a cheaper miter saw are much better for trim applications, but if you don’t have one the trim saw is good with the rip cuts, crosscuts including miter cuts. Even though trim saw looks great, if it doesn’t fit your needs you may want to go with the framing saw. Bigger ‘framing saws’ are much more versatile and can do everything that a trim saw can do and more. You only miss out on compactness and they are usually more expensive. Similar to the case with the trim saw – for crosscuts and mitter cuts, it is better to use a mitter saw and for rip cuts it is better to use a cabinet or hybrid table saw, but the framing circular saw will do the task better than a trim saw. To conclude, both types are great circular saws, but they are used for different applications. If you have to choose I would go with the bigger blade framing saw every time. It is just more versatile than a smaller trim trim style portable circular saw. What is your favorite? Fill in the comment section below.